You care about the environment. So do we. Here, at TDN Creations, we put high regard to recycling. That’s why we use only recycled materials in our processes wherever possible. And we are open to contributing more by taking inspiration from other companies who are already taking the big leap in saving our planet. It takes hard work and discipline to keep up with the growing needs of our environment. But every effort is worth it because we know that each effort we make is a step to saving our planet. Our metals are sourced from a supplier who have earned the SCS recycled content certification audit. SCS is a global leader in verification of environmental and sustainability claims with internationally recognized standards. Their certification ensures that all of our supplier's manufactured gold and silver is certified 100% recycled precious metal content. 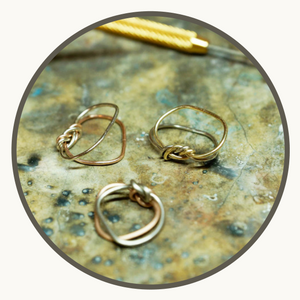 Aside from sourcing metals that we know are 100% recycled, we also do in-house recycling. We have a few designs made out of these clean scrap metals, and we are proud to present it as 100% recycled fine jewelry. We use gemstones that are ethically sourced and conflict-free. While there is a limited stock for these types of gemstones, we give our customers an option to use lab-grown gemstones like Charles & Colvard moissanites and Chatham gemstones. We have invested in an oxygen generator for our studio so that there is no need for us to throw away disposable oxygen bottles. We also use citric acid in our pickling pot so that we don’t have to use toxic chemicals that may add harm to our already suffering environment. We use kraft bubble mailers that contain post-industrial recycled plastics and are proudly made in Canada. We took on new jewelry boxes and made sure that they are made of recycled paper or kraft paper. Our contributions may just be the tip of the iceberg. But as we grow and continue to operate as a company, adhering on these simple steps can make a big change.